Drones Direct launched in 2011 and quickly became a must go to destination for anyone wanting to cut their teeth with drones. Over the last 7 years they have grown their offering, becoming the one stop shop for drones. 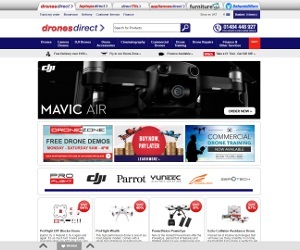 They now sell the biggest and most respected brands of drones including Pro Flight, DJI, Parrot and Yuneec, DJI being the current front runner with drone enthusiasts. Drones have various uses and Drones Direct make it very easy to purchase a drone based on your requirements. They sell standard drones, drones with cameras for photography, drones for video recording, they have products that are ideal for the hobbyist right through for use in a commercial environment.